Coming up on tonight – 5 March – the #oklaed chat will focus on challenging yourself. The idea here is to identify something in your practice that would be a bold new step for you to take. Be intentional here. Think outside the box. Don’t do something crazy just to do something crazy. Have a specific goal in mind. Stretch yourself as an educator and extend your students as learners. That worksheet that you have been using for years – maybe it’s time to go with an interactive digital assignment. I’m not talking about taking that sheet and making it fill in the blank Google Doc either. I’m talking about real stuff. Think Different. Think Awesomesauce. 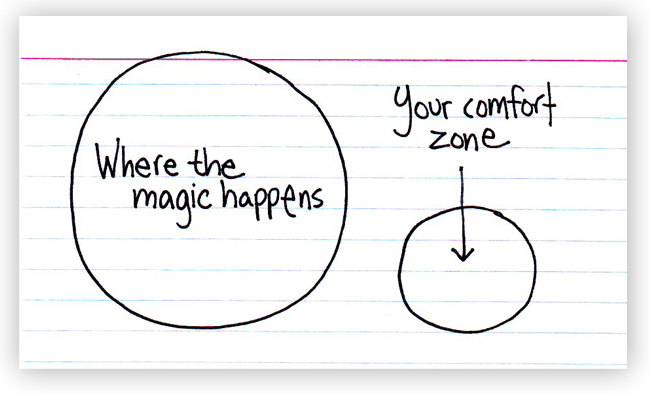 The goal for this chat is to challenge you to move from your comfort zone into a place where the magic happens. Q1: Introduce yourself and share one thing (not education related) that you have always wanted to do, but never done. Q2: What is keeping you from doing that thing that you shared in response to Q1? Q3: What step can you take to do that one thing that you have always wanted to do? Q4: What is one thing you are wanting to try in your classroom – but are afraid? Q5: What is keeping you from doing that thing in your classroom? Q6: What are two small steps you can take to do this one new thing in your classroom? Q7: What are some resources that could be used to learn more about this one thing? Q8: How will you share the results from the change that occurs as a consequence of this one thing – even it they are not so glamorous?